Details Emerge About Washington State High School Shooting : The Two-Way Students of Marysville-Pilchuck High School describe a desperate scene — and in at least one case, a teacher is being credited with helping to prevent more killing. 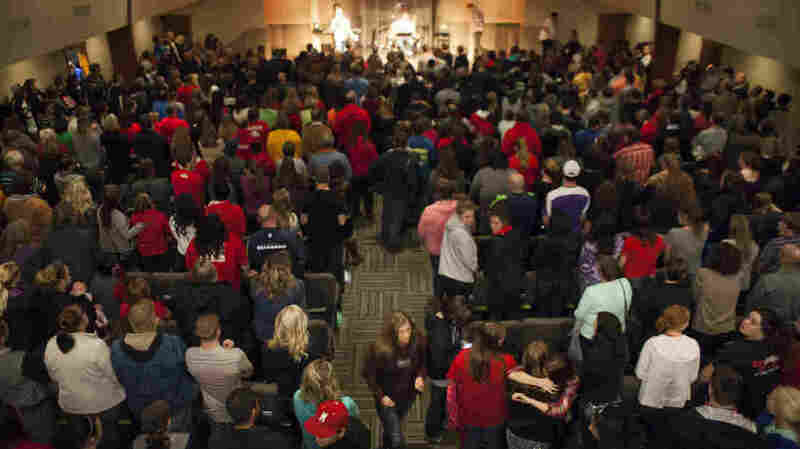 Community members and students from Marysville-Pilchuck High School gather for a vigil at the Grove Church in Marysville, Wash., Friday night. Two students died in the violence, including the gunman. Several more were wounded. One day after gun violence took two lives and wounded four other people in Marysville, Wash., we're learning more about the gunman and the scene of panic that erupted in a high school cafeteria Friday morning. Students of Marysville-Pilchuck High School describe a desperate scene — and a member of the school's staff is being credited with helping to prevent more killing. "They recovered a .40 caliber handgun from the scene, believed to be the weapon used in the shooting," the Snohomish County Sheriff's Department says in its latest update. "The motive for the shooting is still under investigation." Officials haven't publicly released the name of the gunman or the victims; a news conference is scheduled for Saturday afternoon. But students and media outlets have identified him as Jaylen Fryberg, a popular freshman at the school whose family is prominent in the Tulalip Tribes in the community about 30 miles north of Seattle. The gunman died at the scene, reportedly from a bullet from the handgun he brought to school. One girl also died. All of those shot were students; the four who were wounded — two girls and two boys — were in the hospital Friday night, their conditions ranging from serious to being in intensive care. Fryberg's victims reportedly included two of his cousins. "He shot people he cared about," Fryberg's friend and football teammate Dylen Boomer tells the Seattle Times. A student says he saw a woman who works at the school go after the gunman. "I believe she's actually the real hero. She's the one that intercepted him with the gun. He tried either reloading or tried aiming at her. She tried moving his hand away and he tried shooting and shot himself in the neck," student Erick Cervantes tells KIRO. "She heard the gunshots first and she came in running through the door, right next to it," he said. The woman's identity remains unclear; police called her a cafeteria worker, a detail KIRO also reported. But the station says after it showed Cervantes a series of images, he identified the woman as social studies teacher Megan Silberberger, who is reportedly in her first year at the school. The gunman "had been crowned homecoming prince just weeks before [he] opened fire in the cafeteria," member station KUOW reports. The station spoke to students Morgan Van Dalen and Madison McKee, who were only three tables away when the shooting started. Van Dalen said, "I don't know, everyone's surprised about it. Even the teachers. Because he was Homecoming Prince." Van Dalen says that after a moment of surprise, "we all ran. And everyone was falling over each other trying to get out of there." Speaking to the teenagers at a nearby church where officials were reuniting students with their parents, KUOW's Carolyn Adolph says, "Many students looked stoic until their parents arrived. And then the rush of emotion started. Parents and children were trembling and crying." Fryberg is seen in a YouTube video from last week, being introduced to cheers as part of the school's homecoming court. Wearing a tie and a sash, he stands between a cheerleader and another student on the athletic field. 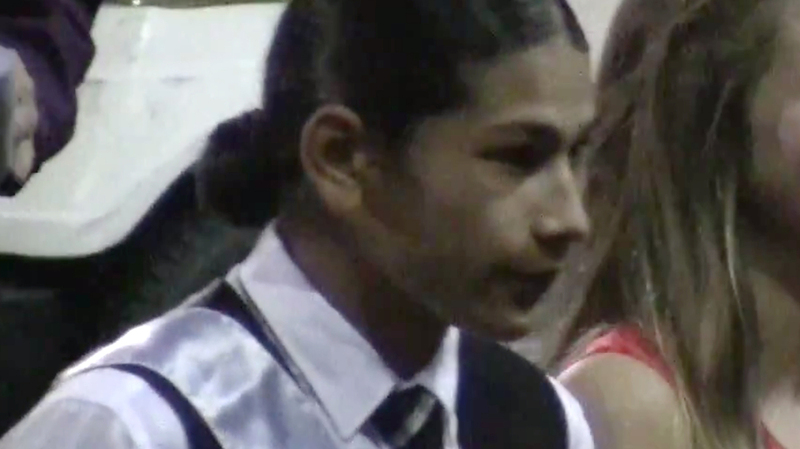 Jaylen Fryberg is seen during a homecoming celebration at Marysville-Pilchuck High School on Friday, Oct. 17, 2014, in this still frame made from a video. Students and others have identified Fryberg as the gunman who walked into his Seattle-area high school cafeteria Friday and opened fire, killing one person and shooting several others. State Sen. John McCoy, D-Tulalip, tells member station KPLU that he knows the Fryberg family and was surprised by the shooting. "I did not really know the boy, but I know the parents. And they don't resort to violence; they normally resort to prayer. They're a very religious family, so this boy doing this is just totally out of character for that family," he said. KPLU reports, "McCoy added the boy grew up in a household where guns and hunting were a big part of life. He did not know how accessible those guns were. Police said the gun used in the shooting had been legally acquired, but did not elaborate." Tulalip Tribes Chairman Herman Williams, Sr., issued a statement in which he confirmed that "tribal members were involved" in the attack. He asked for prayers for those touched by the tragedy. "Our community is reeling from this experience, so we ask that the media and the public honor the families and our children in this time of grief. Sadly, we are now experiencing what has become a national trend, which we, as a society, must address. "These are our children. They are suffering, and their lives will be forever changed."